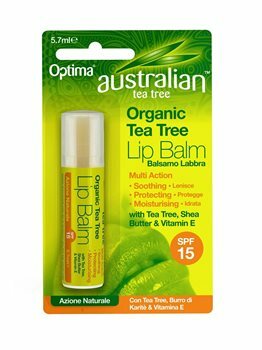 Australian Tea Tree Lip blam provides rich, soothing protection for dry lips. Formulated with Shea Butter to soothe and moisturise the lips, antiseptic Tea Tree Oil and enriched with Vitamin E. This unique formula provides effective protection from the suns harmful UVA and UVB rays through its SPF 18 sunscreen. Tea Tree Oil is a traditional antiseptic oil used for thousands of years by the indigenous population of Australia. Known by many as the most powerful natural antiseptic known to man, this unique oil has numerous benefits due to its antibacterial and antiseptic properties. Ricinus communis (Castor Oil), Candelilla cera, Cetyl ricinoleate, Ozokerite, Isopropyl myristate, Butyrospermum parkii (Shea Butter), BHA, Melaleuca alternifolia (Tea Tree Oil), Parfum (Natural Vanilla), Tocopherol (Vitamin E), Cera microcristallina. Avoid contact with eyes. Store in a cool dry place away from direct sunlight. Do not use if you are sensitive to any of the ingredients. This has to be the best lip balm I have ever used. It moisturises and protects at the same time without over doing it. Perfect for a male who does not want it made obvious he is using any product on his lips! This is OK, but would benefit from being more moisturising. It has left my lips a bit dry, which defeats the object really.